Like many artists, Kai Teichert divides his studio time between two similar yet different practices; imaginative, fantastical oil painting and austere, precise sculpted busts. When working on a bust, the images are kept quite secret. His commissions vary from friends to high ranking political leaders. 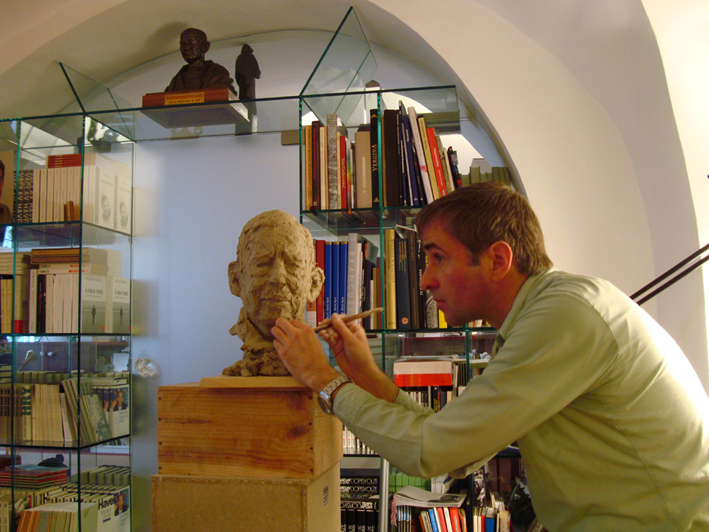 Recently he was invited to sculpt a bust celebrating the life of Vacláv Havel which was publicly revealed for the first time at the Nationaltheater in Prague, November, 17th 2011. Vacláv Havel (born 1936, Czechoslovakia) was the first President of the Czech Republic , 1993-2003 and had previously held the position as the President of Czechoslovakia,1989-1992. He is also a revered playwright, essayist and poet who has written over twenty plays and published many non-fiction works which have been translated and distributed on a global level. The bust was made in two different formats. One is completely unique, fragile, lifelike, painted clay while the other is bronze, originally cast from a wax mold and intended for public display. The bronze can be made into editions, while the other is much more delicate and singular. Process is extremely important for Teichert and he spends many months on the time-consuming process of constructing the three dimensional portrait. He commences upon each project working directly with his subject in a naturalistic life setting. This particular assignment required him to travel to Prague, meet directly with Václav Havel and remain there for a week, working intently each day. The sculpture bust was then transported to Berlin, Germany where the artist is based, further crafted and brought to fruition before arriving at its permanent location at the Nationaltheater in Prague. The benefit of the commemorative bust is that it has an extremely long historical resonance. Early forms were carved out of wood and then dramatic likenesses were captured in smoothed marble perfected by the Greeks (mid 5th century BC) and Romans (146 BC). Kai Teichert has the facility to translate paint into three dimensional form. His painted busts however exact, also have a certain expression, a delightful mark of subtly left by the artists hand. It is at this point where the contemporary practice allows a time specific relevance to shine through. Kai has been fine-tuning his craft of making busts for many years. The works are historical markers of people in his life, both familiar and appointed. In utilizing a time-honored tradition, the artist is able to not only reflect his own world, but also visually contribute within the context of a larger global community. 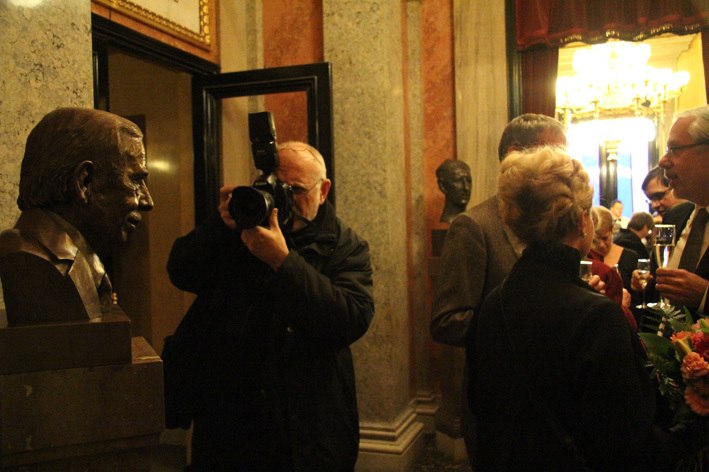 The portrait bust of Václav Havel will remain a comprehensive emblem, arousing memory and commemorating the legacy of a long life, well lived. Congrats to the artist on this important work, we look forward to seeing future projects. 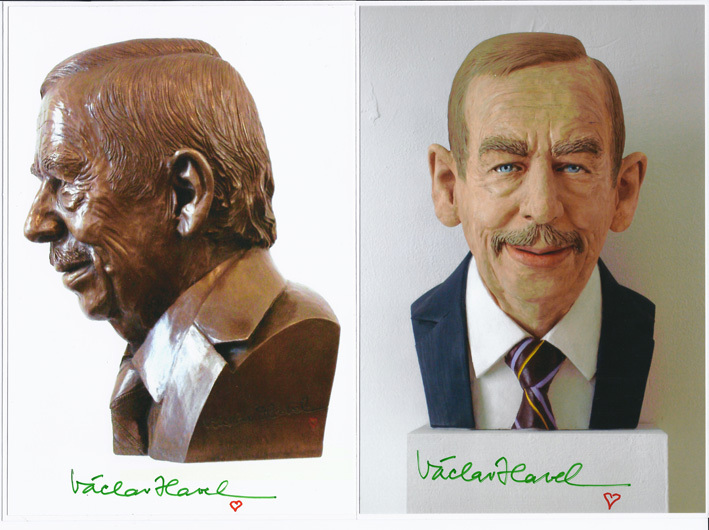 (Update: Václav Havel, October 5th 1936-December 18th, 2011)More soon!